Extra Thanks to Brain Monkeys! When we say that our community comes together to make the Ann Arbor Mini Maker Faire happen, we really mean it. One amazing example is Katie Tilton, founder of Brain Monkeys. Katie has been an exhibitor at the Ann Arbor Mini Maker Faire for several years. In addition to this, she is also a sponsor of the Faire. In addition to that, she is also a volunteer! This year she helped deliver thousands of flyers to elementary and middle schools across Ann Arbor and Saline to promote the Faire. Brain Monkeys was founded by Katie Tilton, a certified school teacher, artist, engineer, inventor and entrepreneur who saw the need to increase the number programs that support discovery based learning. An education company that teaches robotics, technology, engineering and creative arts to students throughout the Ann Arbor area. Brain Monkeys offers after school classes and individualized tutoring, weekend workshops and make-n-takes, home school and small group classes along with an extensive summer camp program! Join Us at Nerd Nite Ann Arbor! 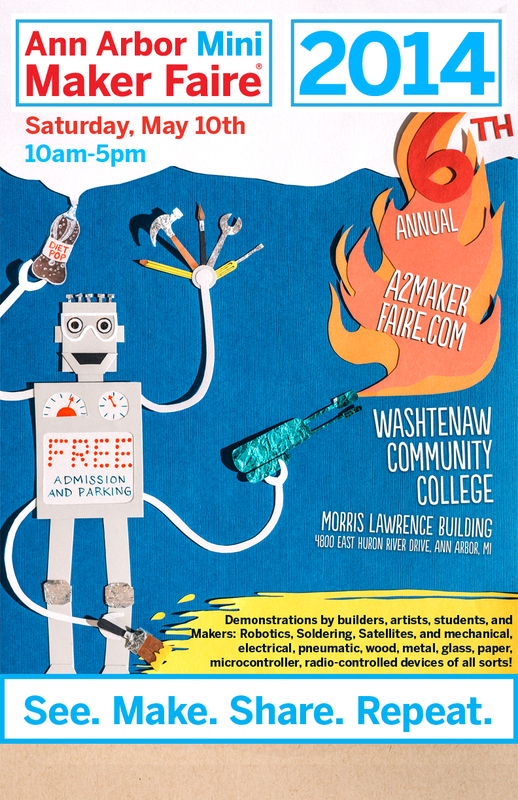 Want to learn about why we love organizing the Ann Arbor Mini Maker Faire year after year? Join us for this week’s Nerd Nite at LIVE at 6:30 PM on Thursday (April 17). $5 at the door. Tickets available at the door or online. I’ll be speaking about why I love organizing the Faire and what it’s meant to me personally. 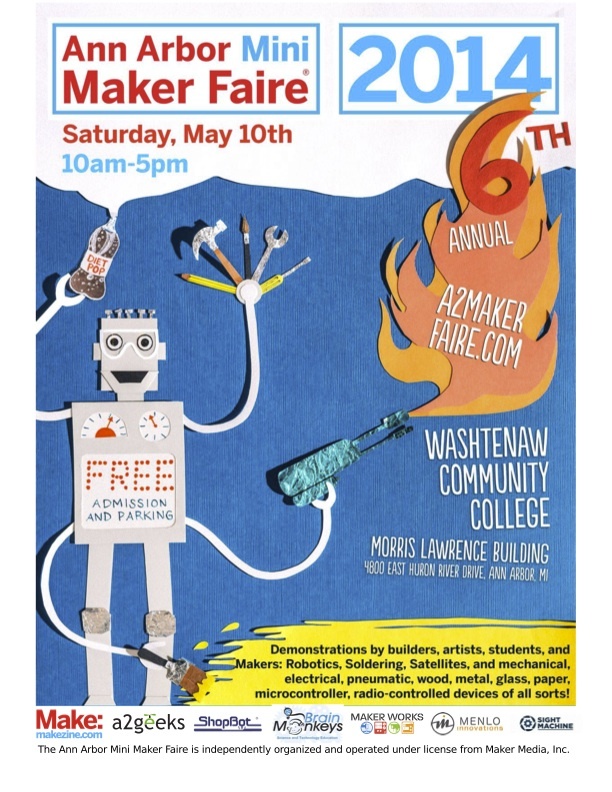 I’ll also be (briefly, quickly, broadly) talking about what it takes to organize a Mini Maker Faire and why we think ours is one of the best in the country. Our 2014 poster artist: Michelle Baker! We want to send a huge THANK YOU to Michelle Baker, of Elevated Press and Michelle Baker studio, for this year’s awesome poster design. She was asked to create this poster on short notice and came up with a beautiful robot, building on our themes of creation, technology, imagination, and fun. We’ll be featuring these posters in the Ann Arbor area. If you want to help spread the word, sign up to volunteer to distribute posters to places you frequent. We will also be printing t-shirts with this poster design that will be for sale at the Ann Arbor Mini Maker Faire. One more reason to attend or to showcase your work!